Do you want to be a better / faster swimmer? 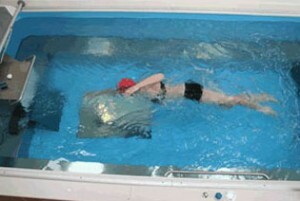 thetrilife.com offers stroke analysis sessions in our Endless Pool based in Kent. Learning to swim efficiently is key to being a better triathlete, but, if you’ve never had your swim stroke analysed or actually seen your own performance in the water, you may be unaware of flaws in your technique. It’s also a great way to overcome or avoid injury. If you’re getting a similar twinge with every swim, you may find that a small adjustment to your technique will make all the difference. And if you’re fortunate enough to be injury free to date, then having your stroke analysed will pick up any rogue areas of your technique which may cause problems down the line. Swimming is many triathletes weakest discipline, but even if it’s your most favourite activity by looking at your own technique, alongside a swim coach, you may find that there are some minor flaws or habits that you’ve picked up, with just small changes needed, which will really boost your performance. A swim stroke analysis session is the first step in understanding the mechanics of the ideal swim stroke and matching that with your own current stroke. Once you have the knowledge in place, you can work towards making improvements in your own performance. Cameras positioned underwater in front of the swimmer, to the side and above the swimmer are used to observe the athletes stroke. A monitor at the side of the Endless Pool provides instant feedback to coach and athlete. An experienced coach will suggest stroke corrections to improve stroke efficiency and drills to effect a change in the stroke. The athlete can modify his or her stroke and immediately see if the desired change has been achieved! For the athlete, this ability to see for his or her own stroke can lead to rapid developments in swim technique. thetrilife.com offers a 60-minute stroke analysis session (min 30 mins pool time) designed to identify areas for improvement. The swimmer will be provided with a CD of video clips of their swimming. As soon as we receive your booking, we will be in touch to arrange a suitable time with you. Session times are available to suit athletes requirements, whether it’s early morning, daytime, evening or weekend. Any questions at all, please email office@thetrilife.com or call Liz on 07791 289792. There is a 10% discount on prices for bookings made by the club secretaries of BTF affiliated triathlon clubs for the purposes of club coaching. Example: A BTF club would like to bring 6 triathletes to use the Endless Pool. The club coach will analyse swimming and coach swimmers using camera and PC technology assisted by a thetrilife technician. We have found 30 mins per swimmer to be ideal (20 mins swim time plus 10 mins review, assessment and discussion). Cost would be £180 less 10% discount or £162 in total or £28 per athlete. To book your Club Coaching Swim Stroke Analysis Session email office@thetrilife.com or call Liz on 07791 289792.
thetrilife.com will work with the BTF Club to organise a time that suits your athletes.